As we approach February, there’s just one thing on the minds of Distinctive Inns of New England (DINE) innkeepers’ minds: romance. While every month romance reigns at the 11 Distinctive Inns of New England, but with Valentine’s Day in the middle of February, intimate moments are just a little more poignant this month. While your romantic New England getaway will ideally include a visit to one of the Distinctive Inns of New England, we know that there are plenty of days where you might want to recreate the amorous escape you love at the 11 DINE inns. We’re here to help you, and as our campaign publicizes, it’s nothing like Grandma’s house. Romance here starts right from the moment you wake up in a luxurious bed, without squeaks or crocheted Afghans. Since breakfast sets the mood for the day, why not start it with a little romance? We’ve found a few recipes that harken back to soda fountain days and will get the heart pounding. Start with a little freshly squeezed OJ, a single red rose and some of his/her favorite brewed coffee, then go from there. The first recipe from Rabbit Hill Inn was featured this month in Every Day with Rachel Ray magazine. Rachel Ray’s editors found it so fun and retro, that they featured this idea as THE best romantic way to start the day. 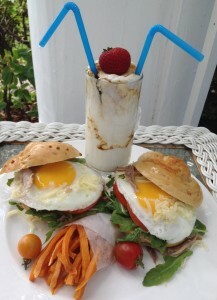 This retro-style breakfast dish for two is perfect choices to serve on “Throw Back Thursdays” or on any day you wish to add a little extra romance. It’s a fun and nostalgic way for couples to start their day. In a tall glass, create layers of syrup and yogurt. Add 2 straws or long spoons. Keep cool until serving. And here’s another heart-warming recipe for your soul mate who prefers sweet over savory from the Captain Jefferds Inn. The red romanov sauce adds that little bit of fiery romance to the morning. Cut the French bread into diagonal slices about ½ inch thick. In a small mixing bowl beat the softened cream cheese, ricotta cheese, peaches and peach preserves together. In a mixing bowl beat the eggs, milk, vanilla, cinnamon, and nutmeg until combined. Melt the butter on a preheated, 350° F. griddle. Dip the stuffed bread slices into egg mixture and cook until golden brown, turning once. Serve with raspberry sauce. Combine all ingredients except vanilla extract in a saucepan. Heat over low heat, stirring occasionally, until butter melts. Do not boil. Remove from heat and add vanilla. Let cool 10 min. Using a rotary beater, beat until slightly thickened. Serves 2. 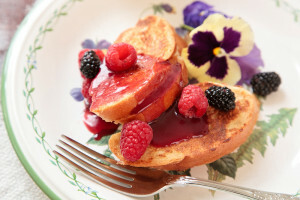 Serve warm over the Peach Stuffed French Toast and you’ll not only warm his or her heart, but you’ll start the day with a very special treat. Of course, if breakfast is not your thing, simply leave the creativity, prep and clean up to us. 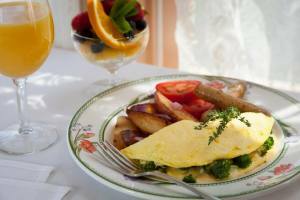 Your Distinctive Inns of New England getaway starts each day with a scrumptious breakfast for two. Don’t wait. Book your New England romantic getaway at one of the 11 DINE properties and leave the romantic breakfasts to us. This entry was posted in advice, Captain Jefferds Inn, culinary travel, Distinctive Inns of New England, Getaway Packages, Holiday, Kennebunkport B&B, Rabbit Hill Inn, Recipe, Romantic Getaway, Valentines day getaway, Winter Getaway Packages and tagged breakfast recipes, Captain Jefferds Inn recipe, create romance from New England inns, New England romantic inns, Rabbit Hill Inn recipe, Valentine's Day breakfast recipe, Valentine's Day recipe by DINE Blogger. Bookmark the permalink.